If you are after the latest generation of pokies then BetSoft has you covered with their 3D specific pokies line, SLOTS3. Their incredible graphics and huge bonus features make other pokies seem dull. Here’s the top 10 poker machines from the SLOTS3 line and all the unique and innovative features BetSoft includes in them. Where can I play BetSoft slots online? BetSoft’s catalogue is highly sought after by the best online casinos and is becoming more widely available to play. Several of the casino sites we promote for Australian and international punters host the top 10 BetSoft games listed above, as well as the software provider’s larger catalogue – all with real money bets, and no need for downloading software, as BetSoft’s games are instant-play and all loadable directly via your Web browsers. Let’s kick things off with a progressive. 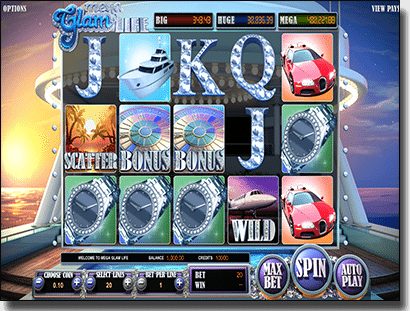 Featuring a theme decked out with luxury, including a giant yacht with diamonds as the symbols and three progressive jackpots on offer, this slot machine has been said to be quite similar to NetEnt’s Mega Fortune Dreams progressive. Nevertheless the 3D graphics are quite incredible and this slot makes you feel like you are a part of something quite exclusive. To win one of the three jackpots, you need to land at least three Bonus symbols (the wheel symbol), on the last three reels of the 5 reel slot. Here you will spin a Wheel where you can win one of the three jackpots. You can also win 7500 coins in the base game by spinning five Yacht symbols. There are 16 free spins with a 3x multiplier attached on offer, which is triggered by landing three or more Scatter symbols (the island paradise symbol), along with re-spins which are triggered by the Wild symbol (the private jet symbol). Land three or more to activate the Wild Re-Spin bonus, where the Wild symbols will stick so you can win big. The betting limits are quite high for this slot with a minimum of $0.40 per spin and it goes right up to $100 per spin. 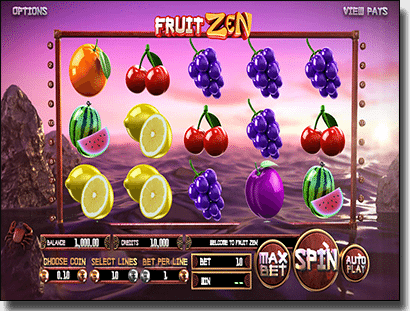 Fruit Zen is a great slot for beginners as it is very tame in comparison to many of the other pokies in the SLOTS3 line, especially since it features just 10 paylines. Fruit Zen is also great for those who enjoy the classic ‘fruit machines’, but want a modern twist. Featuring 3D animations of lemons, cherries, watermelons, and more, the slot machine is set on a backdrop of the ocean, which coincides with the ‘Zen’ concept. Fruit Zen features the Expanding Wild as its main feature, which sees the Wild symbol (the logo of the game) covering an entire reel when it appears on reels two, three, and/or four, and sticks around for a re-spin which is free. If you get another Wild symbol during this re-spin, you get another re-spin and both reels stick for this re-spin. You can do this a maximum of three times. This slot slot pays both ways and has a betting range of a minimum of $0.10 and a maximum of $50 per spin. 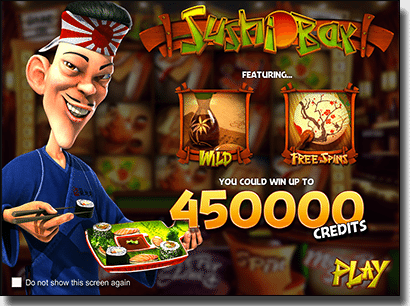 Sushi is an incredibly popular food choice at the moment, so BetSoft have taken advantage of this and created a slot machine that includes high quality animated 3D graphics of sushi and sashimi. While this is still a top poker machine, it is higher on our list as it doesn’t include all the vast array of features which you will notice are included with many of BetSoft’s pokies. Regardless, the simplicity is great for the beginner as with Fruit Zen. There are 25 paylines over 5 reels and players can actually land a reward of 250 coins just by spinning two Scatter symbols (the Japanese fan symbol), with three seeing eight free spins, four seeing 12 free spins, and five seeing 20 free spins. Additionally, the Wild symbol (the soy sauce symbol) replaces all symbols but the Scatter to create more winning combinations. The minimum bet is $0.25 per spin and a maximum of $62.50 per spin. 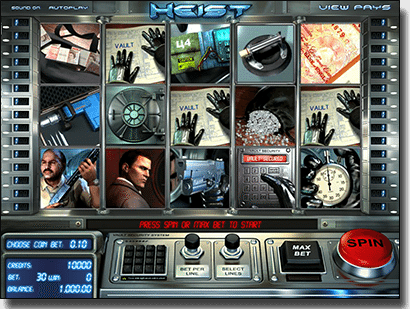 This pokie emulates all our favourite Heist movies, such as Oceans 11, and offers 30 paylines over 5 reels. Here, we follow a heist inside a bank vault and there are a number of bonuses which make breaking into a bank worthwhile. The first feature we look at is the Glass Cutter feature, which is activated by at least three glass cutter symbols, sees players awarded with bonus credit. The second feature, the C4 Explosion feature, activated by spinning the C4 symbol on the third reel, sees an entire reel exploding into Wilds and all wins made by this entire Wild reel are multiplied by two. The Scatter symbol (the drill symbol) doesn’t activate free spins rather it sees three Scatters landing you five times your bet, four Scatters seeing 10 times your bet and finally five Scatters seeing 25 times your bet. Finally, if players land at least three bank vault symbols then the Bank Heist Feature is activated. Here, you can pick how you wish to break into the vault from three options and you then have a small amount of time to take as much cash as you can before the police arrive. The minimum bet is $0.30 per spin and a maximum of $75 per spin. When it comes to playing the pokies, we can be quite greedy, so this fantasy-themed 3D slot is very fitting. Over 5 reels and 30 paylines, there are an array of features including a progressive jackpot available to win on this pokie. The first feature we look at is the Cascading Reels which sees new symbols dropping down when two or more Gold Elf Coin symbols appear after the Greedy Goblins have rushed out and taken them. 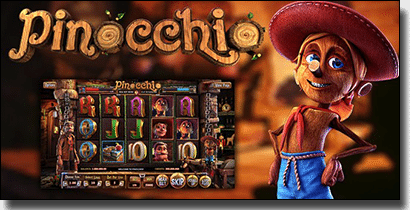 Then there is the 25 free spins on offer, triggered by five Scatter symbols (the wooden welcome sign) and a multiplier of up to 10x available attached to the free spins. Next is the Elves’ Castle Bonus, activated by getting the bonus symbol (the book of Secrets symbol) on the second and fourth reels. Players can pick objects around the castle to reveal a prize. Finally there is a progressive jackpot which can be won by landing five ELF symbols on an active payline when playing the maximum bet. The minimum bet per spin is $0.60 and the maximum is $150 per spin. We don’t care if it is daytime or nighttime, we just enjoy bonuses when playing the slots and BetSoft really comes through with this one. 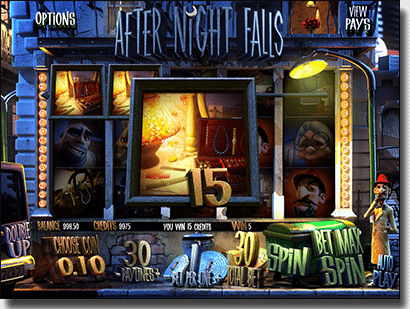 Offering 30 paylines across 5 reels, After Night Falls offers stunning graphics and three unique bonus rounds. First up, there is the Stacked Collapsing Wilds where all symbols which are the same on an entire reel will collapse so additional wins can occur via new symbols, all the while being awarded 3x what the symbol that filled the reel amounts to. You do need to be playing the full 30 paylines for this to be activated though. Then there is the Moving Wilds Feature activated by a magnifying glass symbol which acts as a Wild symbol during the free spins you earn during this feature. Finally there is the 5 Rooms Click Me feature which is activated by three or more Criminal symbols and rewards players with coins by picking apartment doors to ‘steal from’. There are also up to 25 free spins, triggered by up to five Scatter symbols (the desk symbol) along with up to a 10x multiplier attached; and a bonus round, activated by three Bonus symbols (the Granny symbol), which sees players winning credits by solving who broke into Granny’s apartment. There is the option to double your winnings with a ‘Double Up’ button and the minimum bet is $0.60 per spin and a maximum of $75 per spin. 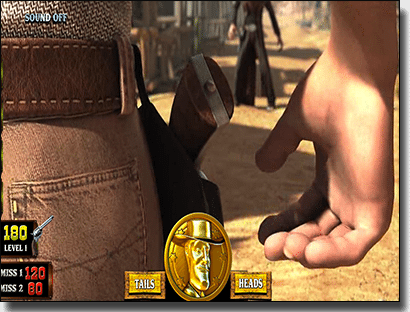 The Wild West is a common theme amongst slots, but BetSoft’s The True Sheriff takes it to a whole new level with their graphics, including gunslingers, saloons, showgirls and more, and massive 750,000 coins on offer to be won. This slot again features 30 paylines and follows the Sheriff cracking down on the bad guys. The Wild Guns feature, triggered by a gun symbol appearing on the third reel, sees five symbols on the reels turn Wild for a re-spin. Then there is the Showdown feature, triggered by the Villain appearing on the fifth reel, the Sheriff appearing on the first reel, and the gun symbol appearing on one of the reels out of the second, third, and fourth. Here, you win a prize by guessing a coin toss correctly. There are up to 15 free spins on offer and you can double your wins by clicking the ‘Double Up’ button. 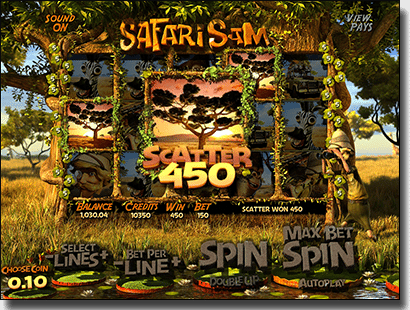 While Mega Moolah offers an African safari and a huge progressive, if you just want a standard 30 payline slot machine that follows an African experience, BetSoft’s 3D graphics can take you there with Safari Sam. There is also $12,500 on offer when you spin the Great White Hunter symbol five times. The Scatter doesn’t work the way it normally does, in that if you spin three Scatter symbols (the Bilbao tree symbol) instead of free spins you receive 450 coins. Spin four Scatters to receive 750 coins and spin five to receive 1500 coins. Additionally, if you help Sam spot animals by spinning three Bonus symbols (the binoculars) you can win up to 4500 coins. There are free spins too though, which are triggered by spinning the zebra, gorilla, and monkey symbols on the same payline. The betting minimum is $0.60 per spin and the maximum is $150. Not to be confused with the Microgaming slot, though this BetSoft version does follow the same tale about a man who has two personalities, since both are based on the story by Robert Louis Stevenson. In this version, he lurks around the reels occasionally making noises and is incredibly animated. What really makes this slot is the graphics, they are very high quality and quite stunning and while the main aim is to win, playing a slot with poor quality graphics is actually quite frustrating. 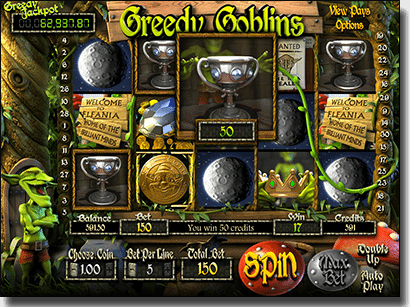 This pokie features 30 paylines over the standard 5 reels, a huge win of 480,000 coins, and unique bonus features. 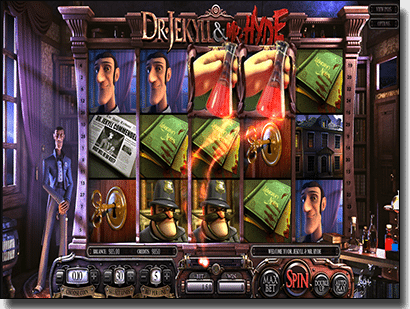 Spin a red potion symbol on the second and the fourth reels and the logo of the pokie, or the Hyde symbol, on the third reel to trigger the Wild Hydes feature, where all logo symbols, as well as all of the Jekyll and Hyde symbols, become Wild Hydes which can potentially earn you a huge win. There is also a blue potion symbol and if you land these in the same manner as above with the Hyde or logo symbol between the two blue potions on the second and fourth reels you will receive a cash reward that is from 5x to 20x your stake. There is a Free Spins Feature which is triggered by 100 red potion symbols, recorded on a meter, as well as a Frenzy Bonus where you can win up to 30x your stake, and a Potions Bonus, where you can win up to 120x your initial bet. .
Players can bet a minimum of $0.60 per spin and a maximum of $150 per spin. This slot is considered to be one of BetSoft’s best. Featuring the much loved classic fairy tale of Pinocchio we get the chance to enter three 3D worlds featuring Pinocchio and his creator Mister Geppetto. While many of BetSoft’s slots feature 30 paylines, as per above, this one only has 15 paylines across 5 reels, but this doesn’t mean it skimps out on the usual generous amount of bonus features BetSoft includes with their slots. There are three worlds that we get to explore as the appearance of the reels and the background changes. These include Gepetto’s Workshop, Pinocchio’s Classroom, and the Puppet Show. It is important to note that the Scatter symbol is different in each world, with the first world featuring the Geppetto symbol as the Scatter, the second featuring the Books symbol, and the third featuring the Wagon symbol as the Scatter. In each world there are free spins, re-spins, and more. But that’s not all, there is also a Real Boy Mode which is triggered by collecting five Real Boy symbols seeing all the Wood Boy symbols turning into Real Boy symbols and acting as Wilds. The minimum bet $1.50 and the maximum is $75 per spin.